There's a company called "Anzo" that sells them, but those same ones are also available on Amazon too. How about "any Nissan dealer or web outlet"? Does anyone actually make a decent aftermarket headlight for the 350Z? I mean if you wanted to switch your old OEMs for something a bit more "modern" looking, now that most cars on the road have that LED strip somewhere incorporated into the headlight/running light. I've looked but so far, all I've found is stuff on CARiD and those Spyder brand lights. I went with DEPO for an ironman swap. The only real flaw that I ran into was that the STI-R lens did not fit perfectly into the lens housing. I had to take off about 1mm of material inside to clear the beveled edge on both sides, and then use spacers to get the lens focused correctly. Otherwise, you can't tell a difference quality-wise. Thanks, I'll search around that site and see if there's anything that catches my eye. I plan to keep my '05 as long as I can and if there's anything on the market that [IMHO] can either enhance it tech/safety wise or keep it looking current I will. Now I know these won't be to most people's liking in here [to each his/her/it's own] but I was looking for something along the lines of this one. And yes, [gasp] it's a Spyder headlight. I just really like that LED strip they've incorporated into the design. I recall there was some company back in 06-07 that would do this for the 350Z, but most of them weren't properly sealed and resulted in all sorts of issues. Those Spyder lights aren't the worst thing in life, and I do like how they incorporate the DRLs, but instead of being a solid strip, there are about 8 little individual LEDs in separate mini reflectors. It would have been better if they used a solid flexible strip or even a switchback strip in that space so it doesn't look like a chain of little lights. I'm also not the biggest fan of the fact that it still utilizes a halogen H1 for the high beam. However, the low beam is an upgrade from the OEM 03-05's since it is a true projector with a D2S bulb and not a D2R. Ideally, I think the best setup in my opinion for an upgraded or more modern look would be a set of 06+ with some FX-R projectors retrofitted in order to have the bi-xenon functionality for both low and high and add an LED switchback strip for DRLs and turns. I think the FX-R's have one of the best flickers and cutoffs out there, but they are enormous and I'm not sure they would even fit in the housing. G8 LED Conversion Kit (H7) (H7XXHLC-G8) by Lumen®. 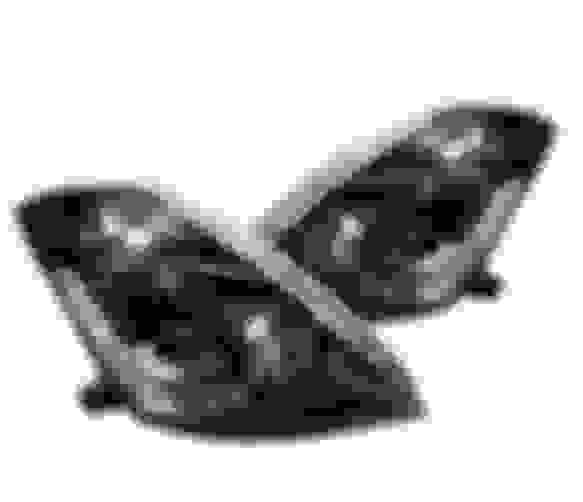 1 Pair, 6500K, 6000lm. 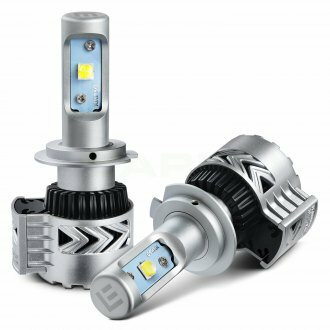 Swap those dull and dim halogen bulbs for this super bright and powerful LED Conversion Kit by Lumen. Lumen knows how to turn your ordinary-looking vehicle into a jaw-dropping light display. Look no further than Lumen when it comes to upgrading your factory lights to LEDs. While being much brighter than its halogen counterparts, Lumen LED bulbs offer outstanding lighting performance, a much longer lifespan, and substantial energy savings with almost no heat. 5-year manufacturer warranty. Decoders are included with purchase, they may not be necessary for installation on your vehicle. CA Prop 65 WARNING - This product contains chemicals known to the State of California to cause cancer, and/or birth defects or other reproductive harm. I have these. Much better than stock 03 headlights. The H7 halogen bulb goes in the reflector marked with the red arrow. You're correct that you can put those H7 conversion LEDs in there. I'm not the biggest fan of the majority of the LED conversion kits but some of the newer models from TRS look decent. I think you'll still need some type of projector to focus the light output, otherwise the light will scatter everywhere. But, maybe that's a good thing when you put on the high beams? It seems that back around 2008 or so, people were complaining about the "Audi" lights. Now it seems people want the LED's on their cars. Well, turns out we were both wrong. Those bulbs that they "specifically" sell along with those aftermarket housings wouldn't fit. And to be honest, I don't know how anyone gets those things in there based on the design of the housing. Too much stuff in the way to adequately seat the LED bulbs, so my installer had to use my old ones from the OEM housings. The new ones look really nice in there. Now lets hope there are no issues with them. That's unfortunate they don't fit. A lot of these LED conversion kits have that huge fan and housing in the back which makes it tough to fit into vehicles where real estate is limited. Do you know where the fitment issues were? Was the LED housing too large and hitting the fender liner or was it the plastic housing on the back of the headlight? I put some H3 LEDs in my fog lights on another vehicle a while back and I had to get creative and trim off a good deal of the back of the fog light housing in order for the LEDs to seat properly and be flush. I doubt you would want to hack up some brand new headlights you just bought in order to make them fit. Hopefully, you can return them for a refund. Okay, just to clarify the ones that I bought that were actually sold along with those housing 'probably' did fit. The problem was since no one at my shop had seen these type of LEDs before [and they weren't the brand they carry] no one knew how exactly to install them. There's a tiny screw in the back and and you can separate the bulb from that fan housing section and then slip the bulb in that way. I contacted the vendor and asked if they could send over a PDF with more detailed instructions, but they want me to show evidence of the bulbs not being able to fit inside the housings. Which is basically impossible now since they're actually installed on my car. So I can't totally sh*t on these bulbs just yet, I blame myself for not researching further and doing proper due diligence on them. I tried taking them apart myself but didn't want to break them since they're brand new out of the box. So hopefully they respond with better instructions. A guy near by is selling a pair for $200. Quick Reply: Were can i buy new oem headlights?